Attack on Titan has finished its TV run, and with no second anime announced, many of you are likely already jonesing for your colossus-killing fix. But don't worry. Not only is there the manga to read, but also no less than seven official games are either out or on the way. This, the first official Attack on Titan game, is a free-to-play microtransaction-based card game. In it, you make a character, collect cards, build your team of popular characters, and, of course, fight titans. You can play it for free with Mobage or GREE (scan the IR code on the game's homepage). This is an updated browser-based version of the mobile game Attack on Titan: The Wings of Counterattack. It finished up its beta test back in August and is expected to be released sometime before the end of the year. This is the first of four visual novels included as part of the first-run Blu-rays of the anime in Japan. Found on the anime's third disc, this game is a spinoff following naturally-skilled giant killer (and fan favorite) Mikasa. The second of four visual novels, A Choice with No Regrets is a story about Erwin and Levi's respective pasts. 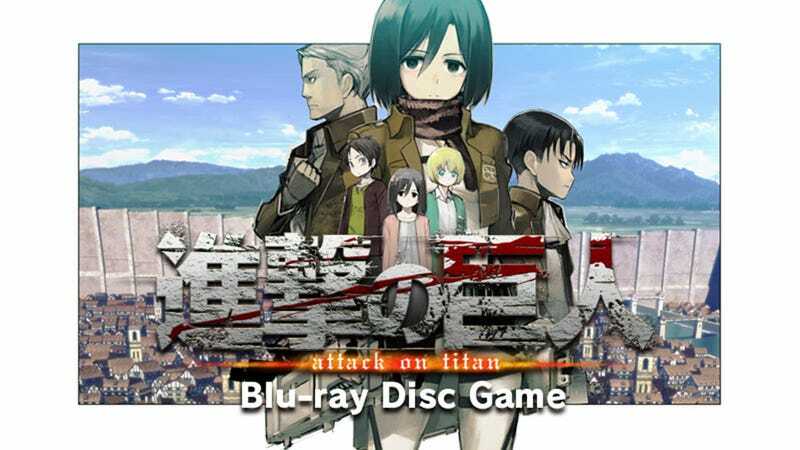 A preview version of the game can be found on the first-run copies of the third Blu-ray alongside Lost in the Cruel World, but the full visual novel will only appear on the sixth Blu-ray. The third visual novel is a side story about Annie, one of the series' most important and mysterious characters. Like A Choice with No Regrets, it will be available on the sixth Blu-ray disc in Japan. The final—and yet to be titled—visual novel is a side story following Eren and Levi. Like A Choice with No Regrets and Wall Sina, Goodbye, it will appear on the sixth Japanese Blu-ray this December. While all the other games on this list have been mobile games, browser games, or visual novels, this is the first official Attack on Titan game that allows you to take control and swing through the cities, chopping the necks out of titans. But don't take my word for it; check out the awesome new gameplay trailer. Are all the official games still not enough? Then be sure to try out the excellent fan-made Titan Hunter or boot up Second Life and check out its Attack on Titan-inspired town.